I’ve loved the city of Boston since my classmates and I went on a school field trip to the city five decades ago. My fondness for Beantown only grew when members of my family lived and worked there for a number of years. We spent the most wonderful times together, enjoying the beauty, history and total experience that Boston offers. It’s a great city for just walking around. From the downtown skyscrapers and amazing restaurants to the reminders of what this city and country were founded on – Bunker Hill Monument, Faneuil Hall, Paul Revere’s House, The Old North Church, The U.S.S. Constitution – Boston provides everything its’ visitors and residents could ever want. It is the Cradle of Liberty. It’s more than that, though. It’s a place where community means everything and nothing proved that sentiment more than the events of this past week. The two bomb attacks during the Boston Marathon were horrendous, but the two bombers had underestimated the strength and resilience of the people they had dared to attack, as well as the unapologetic love and loyalty that Bostonians have for the place they proudly call home. It wasn’t just their initial response on that terrible Monday afternoon. It was the outpouring of support, both for those who were hurt and killed as well as for the efforts of law enforcement to apprehend the two monsters. Anyone who had a camera or cellphone with photos and videos of the area near the finish line came forward, hoping that they might somehow be able to provide the Boston PD and FBI with some clue as to who was responsible. In a time when people don’t come forward because they don’t want to get involved or are afraid of ramifications, the good people of Boston did what all of us hope we’d do. They helped. That’s a rare and wonderful thing these days and I couldn’t help but be moved by each and every one of them. Then, Thursday night, a different kind of phenomenon happened. I was on Twitter at about 10PM when I saw a tweet about a shooting of a police officer at the Massachusetts Institute of Technology. For a moment, I wondered if this was, in some way, tied to the bombing. I turned on the television, looking for some news coverage, but CNN and MSNBC were airing episodes of AC360 and Rachel Maddow from earlier in the evening. I turned back to Twitter and watched as people began to report news that the main stream media hadn’t even begun to cover. I normally pay very little attention to most tweets – they’re usually about Housewives or somebody’s personal Twitter war, but last night, however, were some of Twitter’s finest hours. One young man seemed to be getting his information from sources that, from all appearances, were reliable and reasonable. Elliot Friar is a student in the Boston area and, if I had the power to do anything about it, I think he should take over for Wolf Blitzer, Jake Tapper or any of the so-called journalists. Elliot spent hours, well, probably most the night and day, tweeting the events exactly how they happened, calmly, responsibly and tirelessly. Many of us on Twitter had expressed our frustration with the lack of coverage by all of the major networks, but we really didn’t need more than Elliot. Thanks to this young man, we Tweeps knew about the car jacking and the police pursuit. He let us know that there had been explosions and exchanges of gunfire between the police and the suspects. With his information, we also were made aware of what neighborhoods were involved and who might be in harm’s way. Elliot stayed with the story, reporting that he’d gotten about an hour or so of sleep, right up until the second suspect was taken into custody. Prior to the arrest, he offered a photo of the boat in the backyard where the 19 year old bomber had been cornered. He tweeted only that which he was sure of and which had been confirmed by the police. The same couldn’t be said for the MSM. As one man tweeted regarding the television reports: “NBC: Suspect is not moving. FOX: Suspect is moving. CNN: Suspect is doing gangnam style.” It’s funny, but it’s pretty close to the truth. Going back over the past week and the way the MSM reported events, I’ve read comments questioning the need for television news. A lot of the same things I’ve written about the media in some of my posts has been reiterated by viewers and readers. Social media may very well be the future for the news, particularly in light of the way most of the major networks are reporting it – recklessly and irresponsibly. It took the folks in Boston who not only did their part in the investigation, but also saw to it that the story was reported correctly. 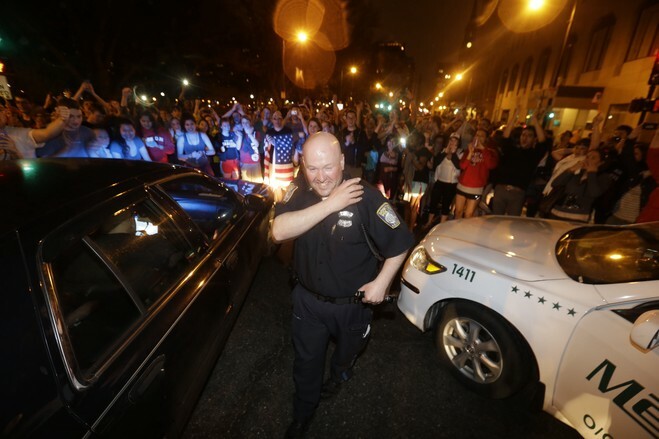 Now that the week-long ordeal is over, the people of Boston have cheered for the members of law enforcement as they made their way out of the neighborhood while the men and women in uniform shouted their thanks in response. In the days to come, we’re going to hear and see endless news reports about the two young men who tried to break a city. Right now, however, the bigger story is about Boston and the example they’ve set for the rest of us. This is how they roll – one city, one voice, all heroes. Boston strong. I’d like to thank Elliot for giving me permission to use his name and being one of the people in the Boston area who made this post worth writing. This entry was posted in In The News and tagged Boston, Boston Marathon, Boston PD, FBI. Bookmark the permalink. Fantastic Empress 😀 and major Kudos to ‘Elliot’. I don’t do twitter as you know but I love your take on the MSM, especially when it comes to ‘breaking’ news. Rarely by the time you see it there, is it breaking, or news. Especially nowadays. Glad part one of this spectacle is over, one of these bombers is dead from what I understand, and the other is in custody. Twitter really outdid itself over the past few days. One woman posted a video she made of the initial shoot out from the wee hours of Friday morning. Another man posted pictures of the bullet holes in his house and the police robot searching vehicles. Another thing that Elliot posted was a link to an online police scanner, allowing us to hear the radio transmissions of the Watertown, Cambridge and Boston PDs in real time. I saw the shootout video on YouTube. Police scanner… Cool.. Get the REAL info, not what some talking head in another state Thinks is going on. Great Post Empress. My sentiments exactly about the so-called news industry of today. I agree wholeheartedly with your feelings about MSM. I noticed NBC was trying to be more careful last night so they are aware of our feelings at least. JWiJ, The “real” NBC – Brian Williams, Pete Williams, etc. did a much better job than their fellow talking heads over at MSNBC. Thanks bb, CNN would do themselves a favor by offering Wolf Blitzer a golden parachute. So proud of all who made the outcome what it is…. glad that the “suspect” was taken alive. Now maybe we will get answers to the many questions that linger. I was glad to see that they captured bomber #2 alive. I’m not sure that he has all the answers – I think his older brother was more of the mastermind – but whatever info he can offer to our intelligence community has to be of some help in understanding why someone becomes “radicalized”, if that ends up being the case here. Without getting into a huge political/policy debate, the sad truth is that America, or its’ leaders anyway, have made poor choices and formed even poorer alliances. Now we’re paying the price. I wish it was different but nobody in charge is asking us. It had always infuriated me that many people who emigrated here use our hard won Freedom to criticize, mock & abuse us. I sincerely hope that Boston holds another marathon this summer. Not as a competive event – but as a FU to anyone who thinks they can kill Our Spirit with a couple of well placed bombs or planes. Bostonians are a proud and resilient people and I think they showed the world just what they’re willing to do to prove they can’t be broken. No one complained about staying in or being evacuated from their homes to help LEOs find the bad guys – just one example of what they endured to take back their safety, security and their city. I may be a life-long, diehard New York Yankees fan, but I’d give anything to be in Fenway Park right now. I am still shaken up with the images of military like police going door to door and people walking out of their houses hands in the air with multiple guns pointed at their heads, then their houses were being illegally searched. Hey Donna. I didn’t see police officers holding guns to anyone’s heads. In fact, I saw images of LEOs helping people carry their children to safer areas and, in one instance, a police officer bought and delivered 2 gallons of milk because one family had run out and needed it for their children. As for the illegal searches, there are exceptions to the warrant requirement of the 4th Amendment. First of all, none of the people whose homes were searched were considered suspects in a crime – therefore, the need for a warrant to “search and seize” their personal property wasn’t at issue. The searches were conducted to locate and apprehend bomber #2, a person who had already been identified and whose face was known to the police. The searches were done for the purposes of public safety, something that could be argued falls under the exigent circumstances exception to the warrant requirement. The homeowners could, quite possibly, have given permission for the searches – another exception to the 4th Amendment. There’s plenty of case law to support what the police did that day. There’s a lot of stuff about these events that could be criticized, but I, for one, didn’t see this as some sort of activity by a police state where US citizens had their rights stripped. Yes I was shaken and deeply sad for the loss of close contact with our local police department after viewing the events on TV. The old police department one could park out front honk your horn for protection and they could come to your car (which I did when someone was following me around.) Eons ago I caught my youngest son and his friend shop lifting, I marked him back to the store and made him return the merchandise to the manager. I then took them to the police station and told them to throw these thieves in jail. The officers hard a hard time to keep from smiling, my son and his friend were given a tour of the jail cells and a good talking to. The doors to the new station is a long walk from the parking lot. When you walk into the lobby it is an unfriendly atmosphere. If I took my son there today, most likely charges would be pressed against them. I miss the days when a police car when down my road I could given them a friendly smile and wave instead of being stared at with a scowl while sitting on my front porch.